Oriol Ribera – Master in Landscape Architecture Barcelona – Universitat Politècnica de Catalunya – 35ª EDITION. Oriol Ribera Cabestany, Born in Barcelona in 1961, Architect by the School of Architecture of Barcelona, ​​1990. Since 1996, he has been working at La Mancomunidad de Municipios of the Metropolitan Area of ​​Barcelona (MMAMB) as an Architect who drafts public space projects and since 2000 as “Cap de Projectes” of this supramunicipal administration. He is responsible for the drafting of projects and execution of works in the metropolitan area of ​​Barcelona. 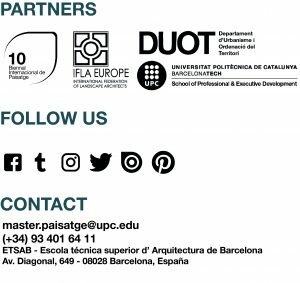 Architect invited to the Master of Urban Planning of the UPC in the years 2002 and 2003. Visiting Professor for the European program URBALTO to the workshop “public space, living and transport” in Riga, Latvia, in 2001, to the subject Workshop of Projects II of the Diploma of Landscape of the UPC 2003-2004, to the workshop of the program European TEMPUS “From Memory to the Future” in Sarajevo in 2004, and the “Espai Públic” course of the Master of Paisatge de l’ETSAB a l’any 2016.